BT 7610 Quad (4 Handsets) is a fully packed digital phone that also looks stylish and will suit any room. Featuring the BT's new feature "Block Nuisance Calls". The BT 7610 features some of the best Nuisance Call Blocking technology. This amazing technology offers users excelent control over which calls they want to allow. You can are able to block a list individual numbers. Additionally you are able to block calls by their type. Examples include witheld or international. So long as you add your contacts to your phone, they can bypass the call blocking, so you don't miss them all important calls from friends or relatives. 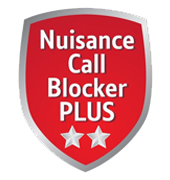 The BT 7610 boasts the new BT feature "Nuisance Call Blocker", this feature allows you to choose the type of calls you block. Calls can still go through to the answer machine if you wish or you can block specific numbers from getting through. Need to send a text and cant find your mobile, use your home phone instead! Yes that right you can use the BT 7610 to send SMS Text message, you can also receive texts. Caller display shows the incoming number that is calling, if that number one of your contacts saved in your 200 Name and Number directory then their name will also show (Caller Display service from your network provider). 30 Minutes recording time means that you dont need to worry about missing those important messages that are left while youre out. Remote access means that you can call your home number enter your PIN and hear all your messages, from any landline or mobile phone.